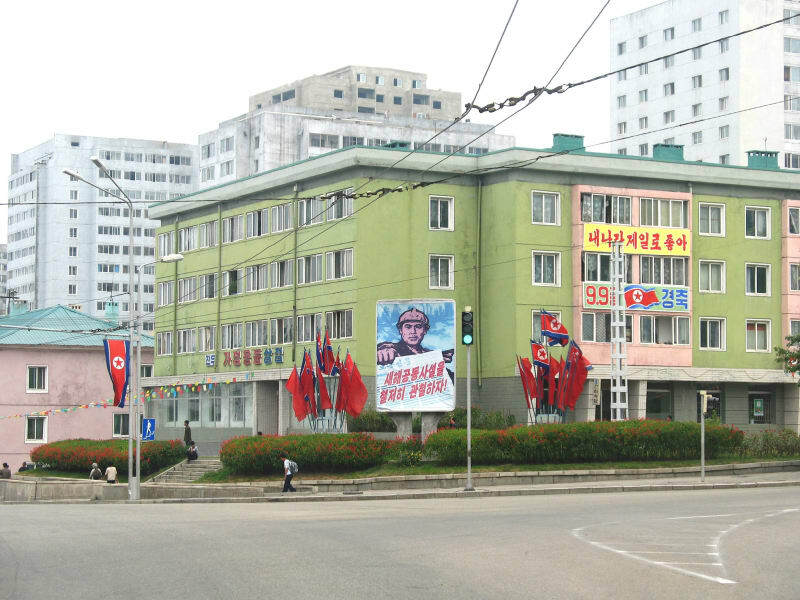 North Korea's architecture is truly fascinating. 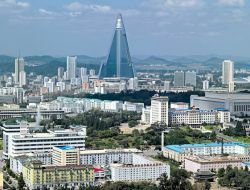 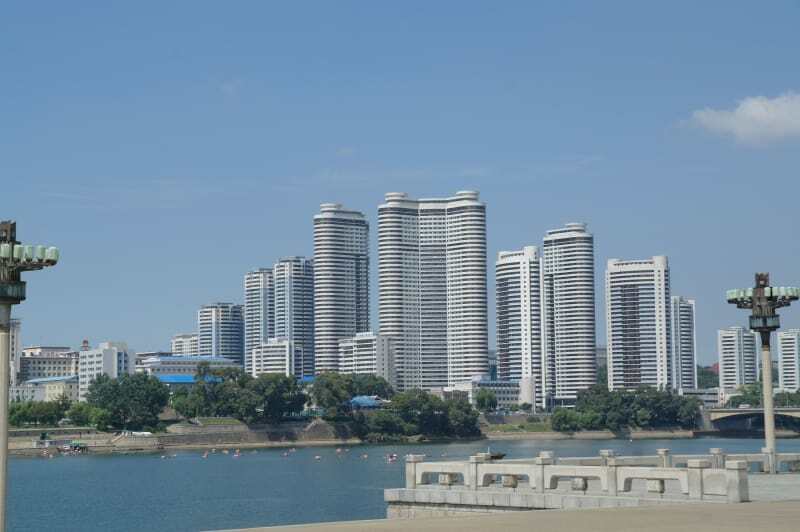 The total destruction of Pyongyang during the Korean War gave Korean architects a great opportunity to build a capital in a Juche image. 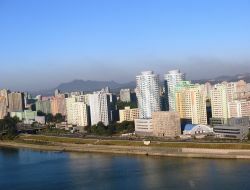 While the city's monuments are its most immediately striking feature, the capital is also notable for its wide, mostly empty streets and boulevards. 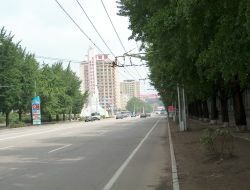 The streets are sparsely occupied by bicycles, pedestrains, and a few city buses. 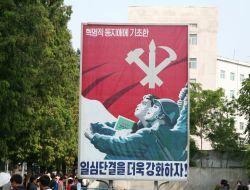 Advertising is also notably absent, though patriotic slogans are common on buildings, monuments, and billboards throughout the city. 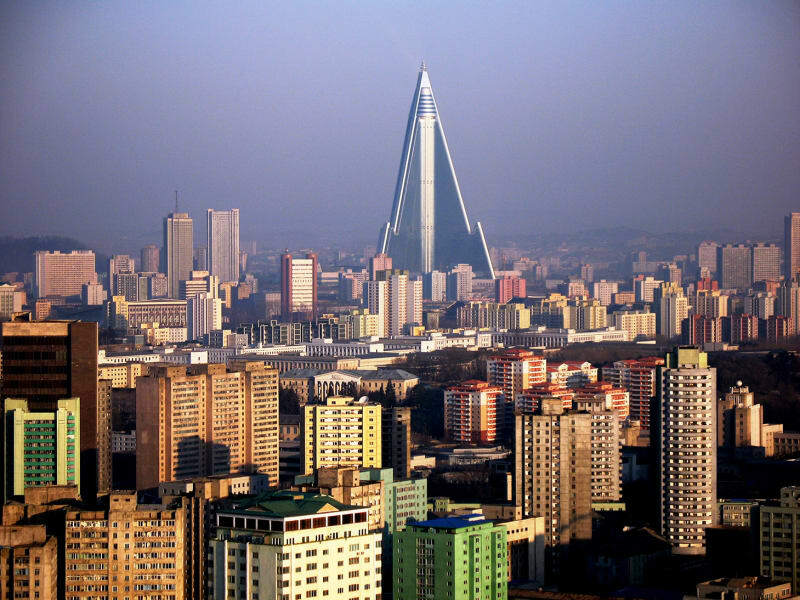 The capital had to be rebuilt, quickly, simply. 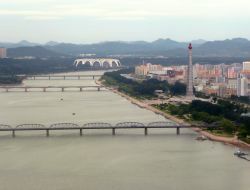 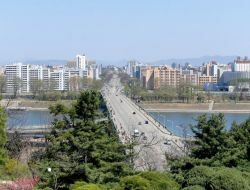 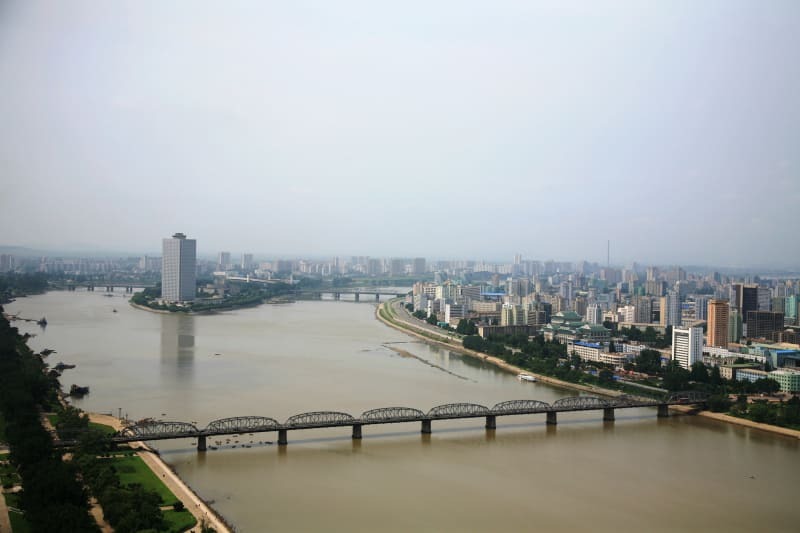 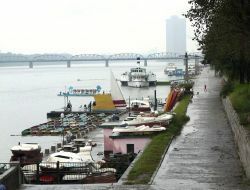 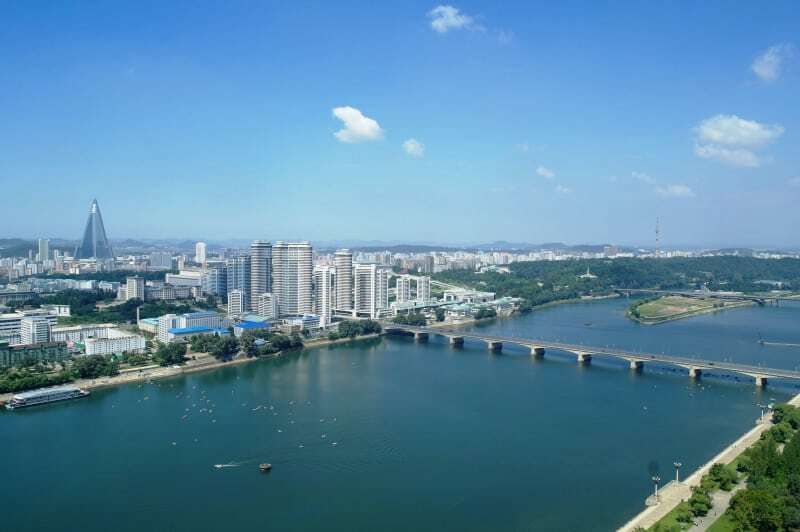 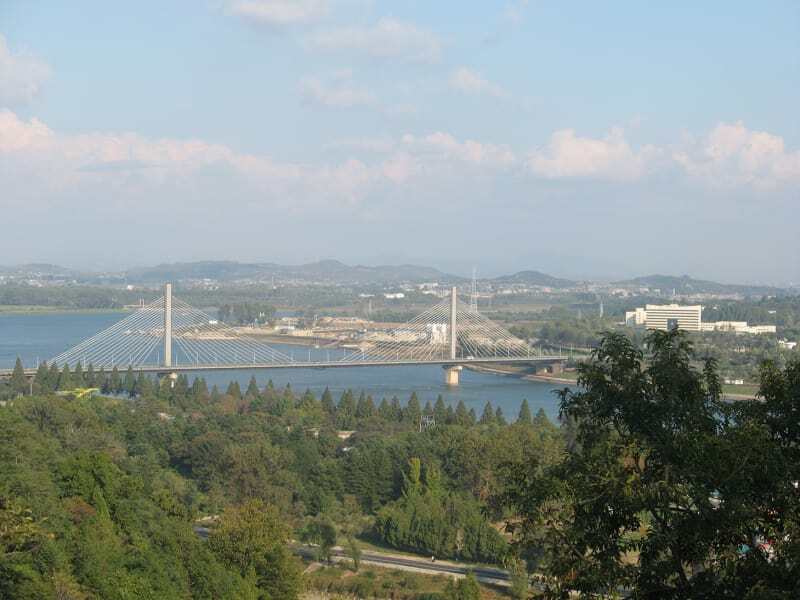 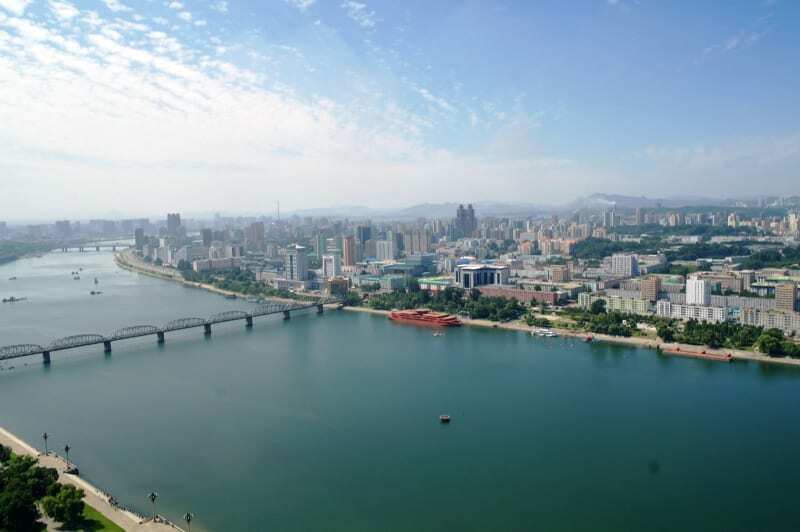 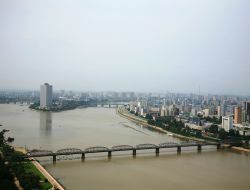 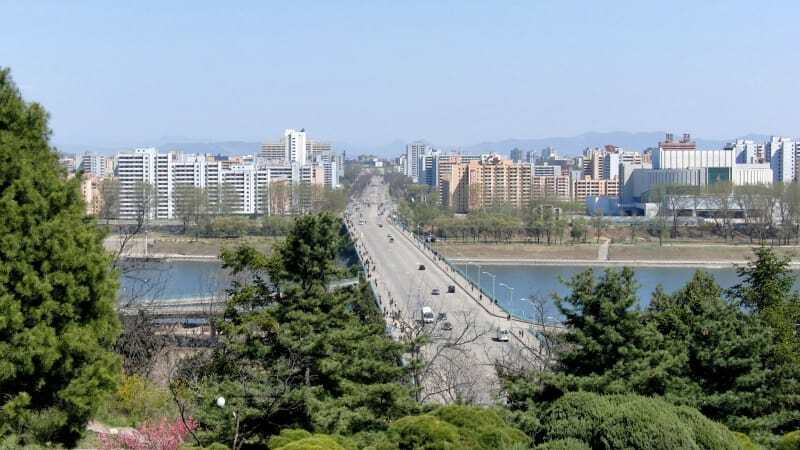 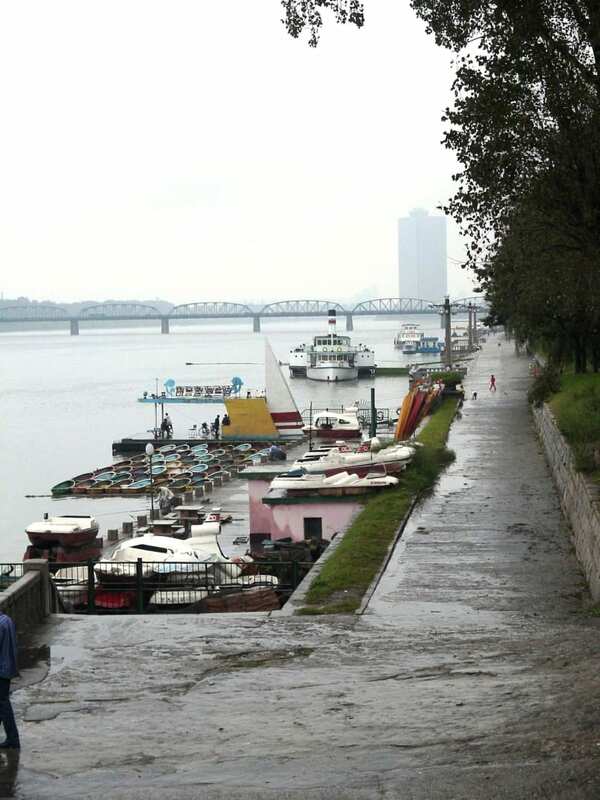 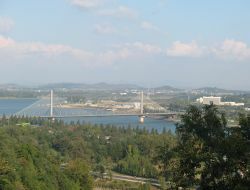 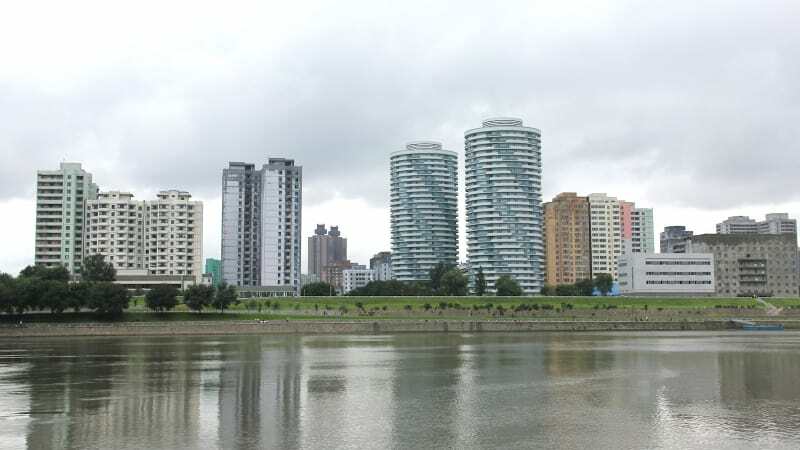 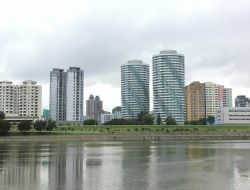 The city was planned around the River Taedong as a 'garden city' with over 200 green spaces, tree-lined roads and riverside walks. 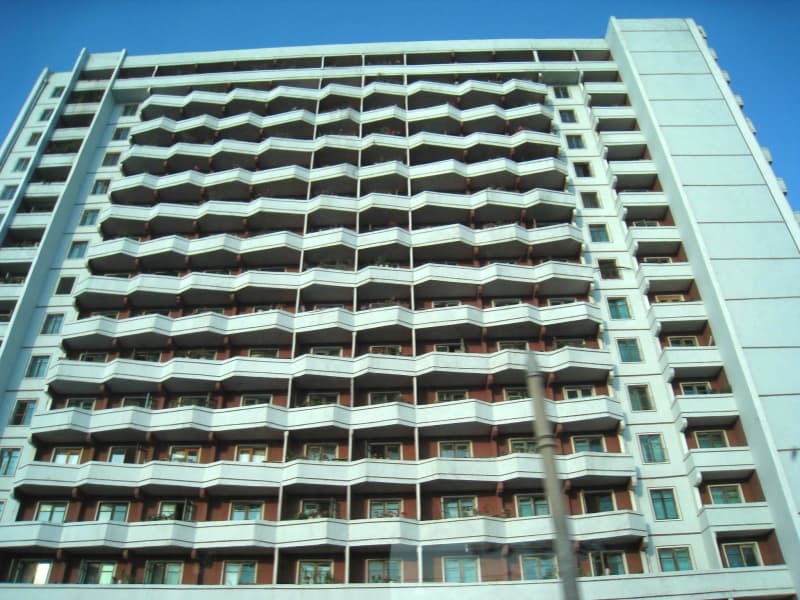 The buildings of the late 1970s and 1980s are a great improvement over their predecessors that suffered poor wiring and uneven heating. 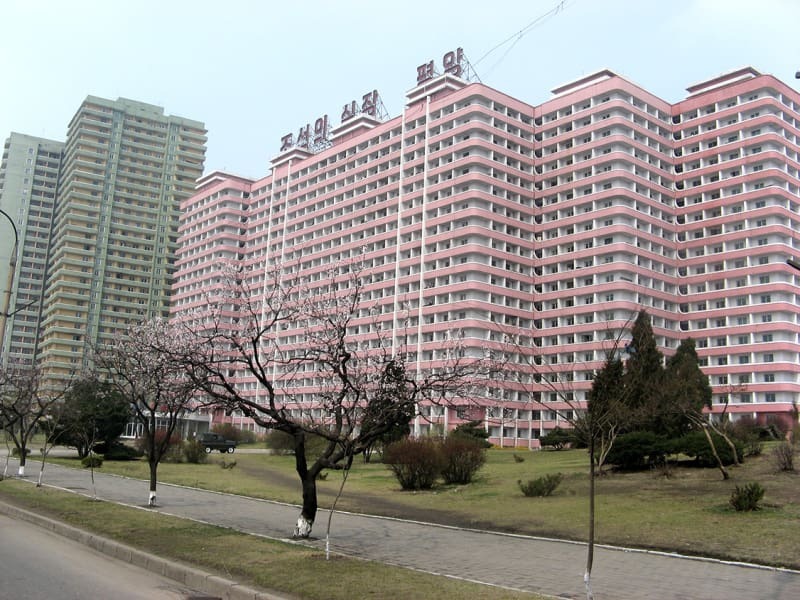 Heating in many appartment blocks is of traditional Korean type, with stove-heated ar piped under the floor and hot water provided from the city's thermal plants. 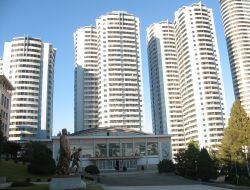 Stoves are still major source of heating in modern flats. 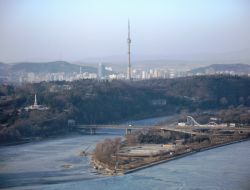 Pyongyang is the sister city to Kathmandu, and was the inspiration for Romania's communist leader Nicolae Ceausescu to model much of Romanian capital Bucharest as monument to the country's glories. 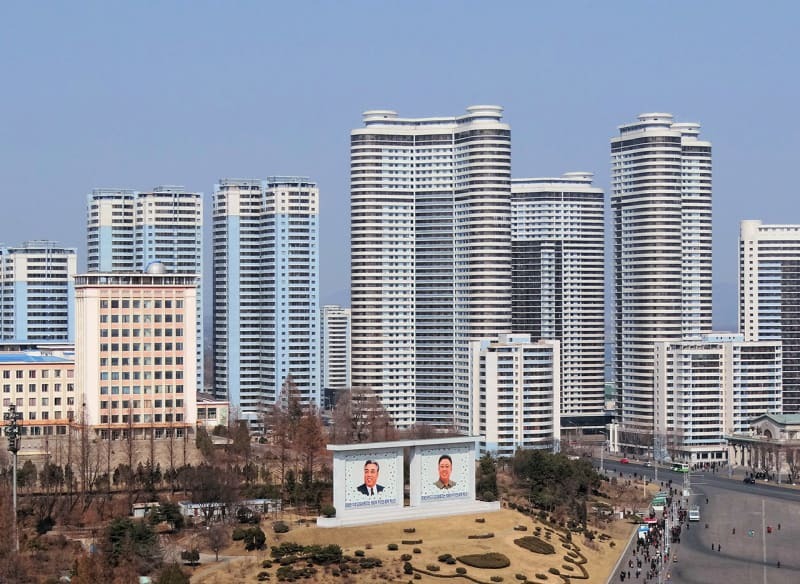 Most streets are boulevards of utilitarian high-rise blocks. 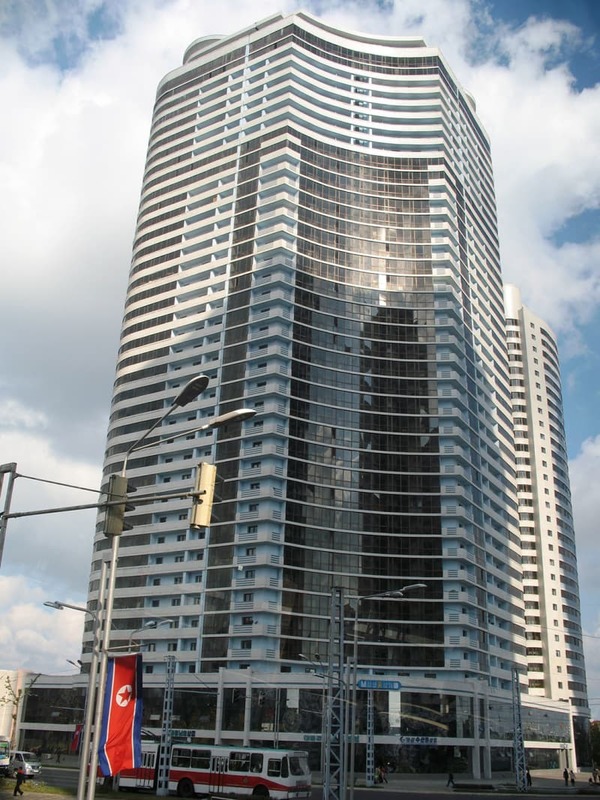 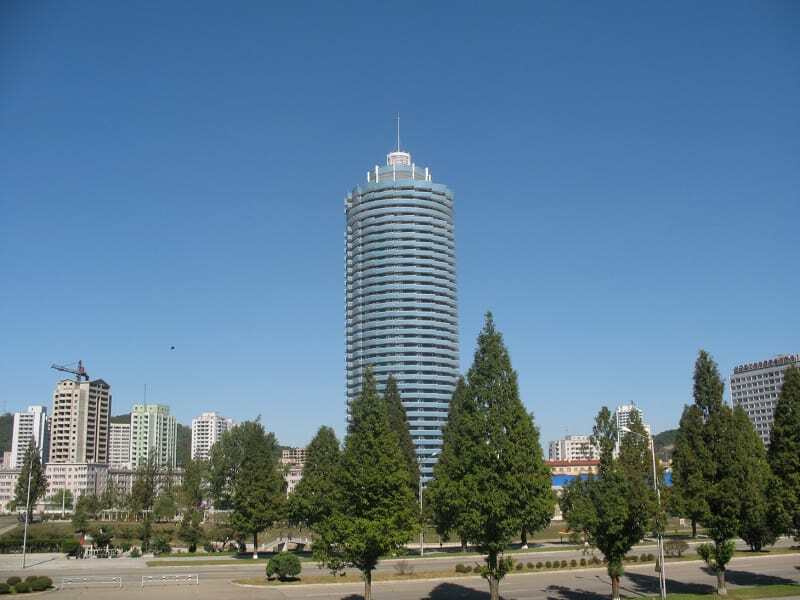 Many buildings are between 20 and 40 storeys tall. 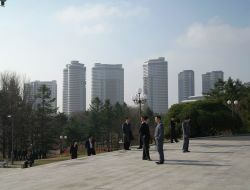 There are three main types of grand, public buildings. 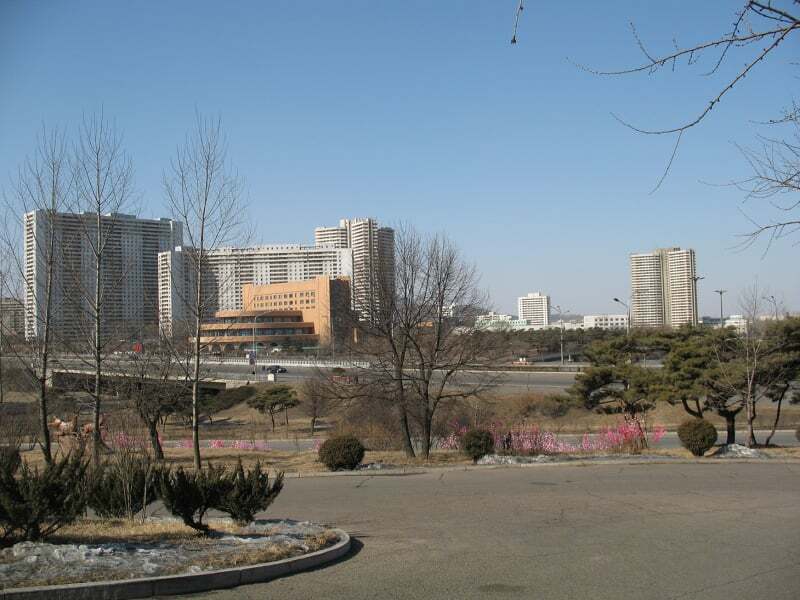 The first is the classically derived grandeur, all pedestals, pillars and steps like the Moranbong Theatre, or Mansudae Assembly Hall and the Kumsusan Memorial Palace of the Sun. 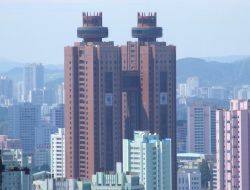 The second style was built atop the first. 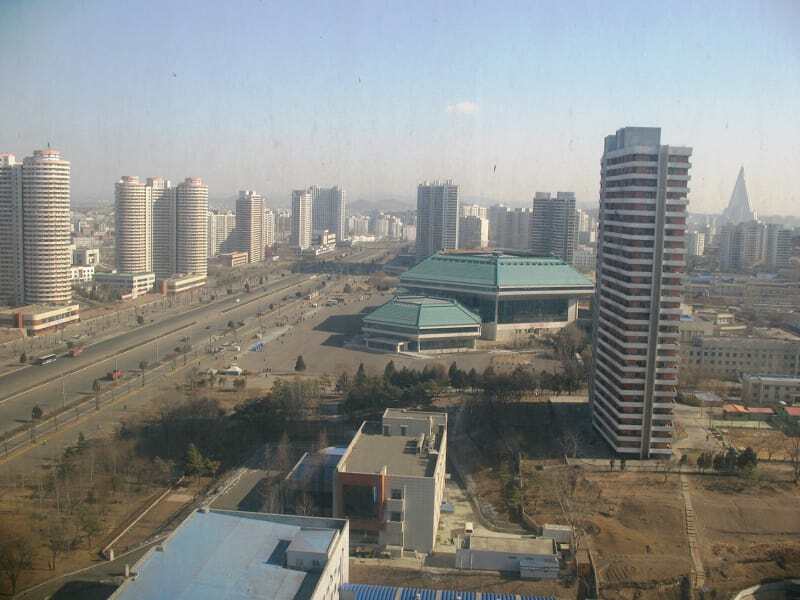 While the floor space if the classical structures was appreciated, the acades changed from very late 1960s onwards with the plain Soviet austerity being at first augmented, then replaced, with traditional Korean-style fronts and sweeping roofs:Grand People's Study House, Pyongyan International House, Okryu restaurant. 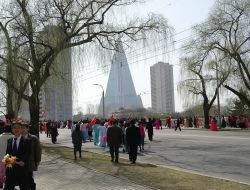 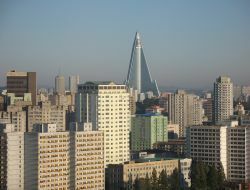 Some building combine the two styles such that the bottom half is Stalinist and the top is Korean. 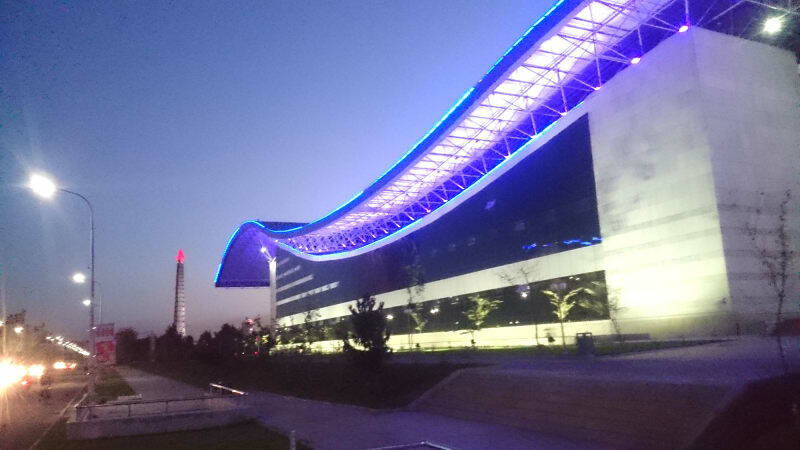 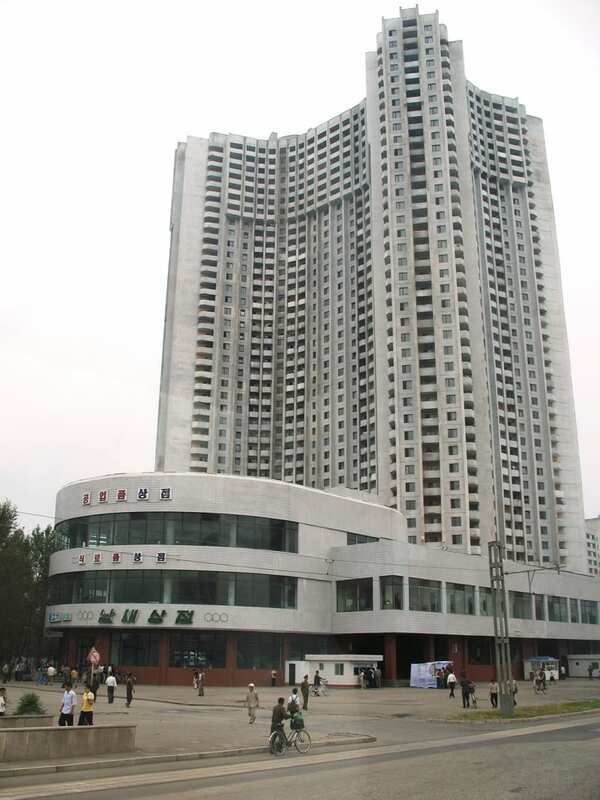 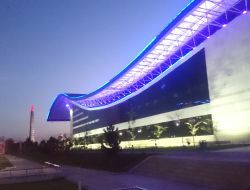 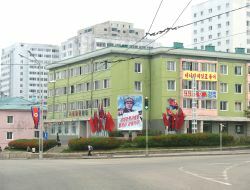 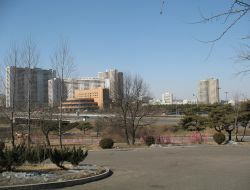 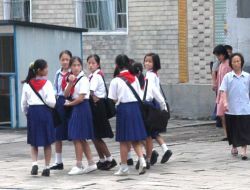 The third, the neo-Korean architecture was made to reflect the emergece of the DPRK as a power and culture in its own right, cutting its own path in the world, as well as the styles being also technically and commercially affordable to use: Pyongyang Inernational Cinema, Chongryu restaurant, the ICe Rink, Chongchun street, Ryugyong Hotel, East Pyongyang Grand Theatre, Monument to the Party Founding. 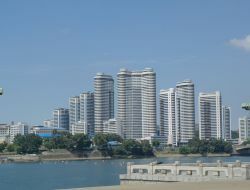 Monumental residental developments of Tongil Street, south of Yanggak Islet, and Kwangbok Street are owerwhelming. 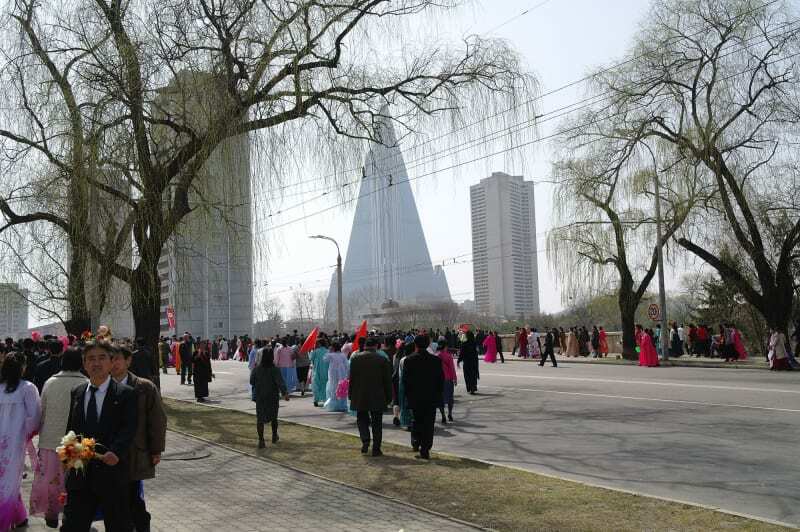 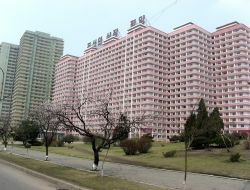 The Yanggakdo International Hotel is the largest working hotel and the second tallest building in North Korea, after the Ryugyong Hotel. 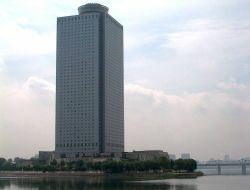 It rises to an overall height of 170 metres (560 ft) and has a slowly revolving restaurant on the 47th floor. 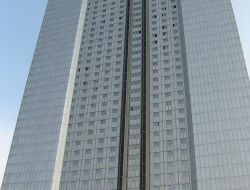 The hotel is said to contain 1,000 rooms and a total floor space of 87,870 square metres (945,800 sq ft). 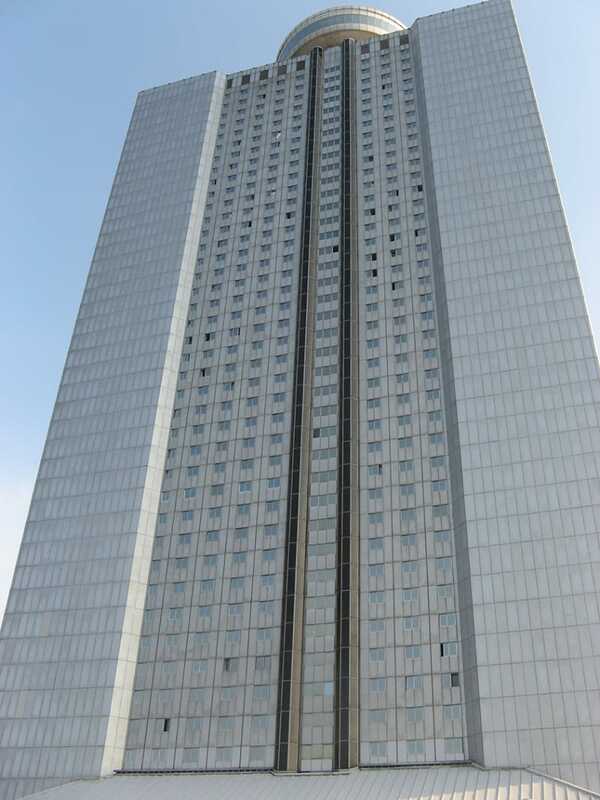 The structure was built between 1986 and 1992 by France's Campenon Bernard Construction Company and opened in 1995. 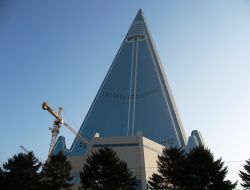 The Ryugyong Hotel (sometimes anglicised as Ryu-Gyong Hotel or Yu-Kyung Hotel) is a 105-storey pyramid-shaped skyscraper. 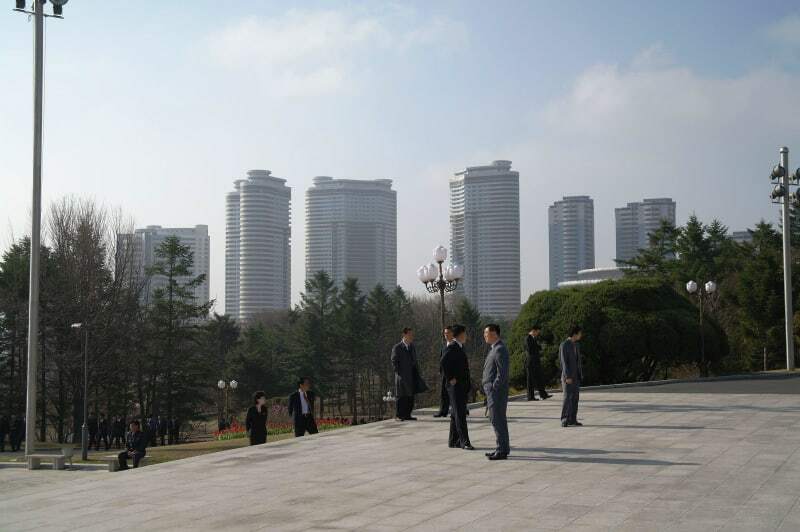 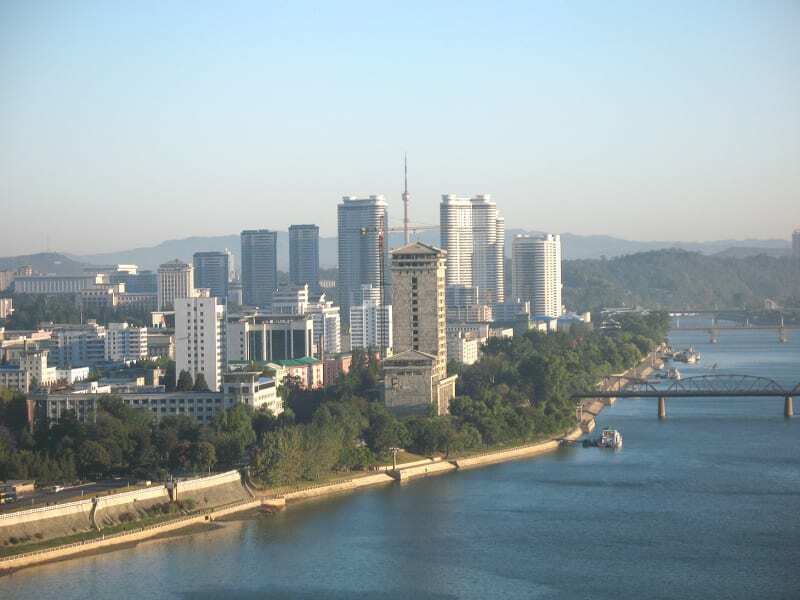 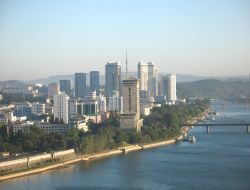 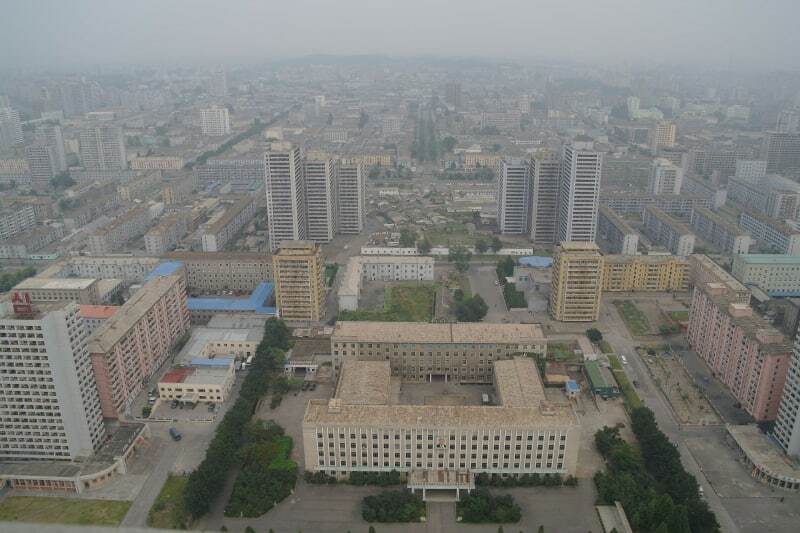 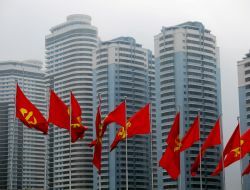 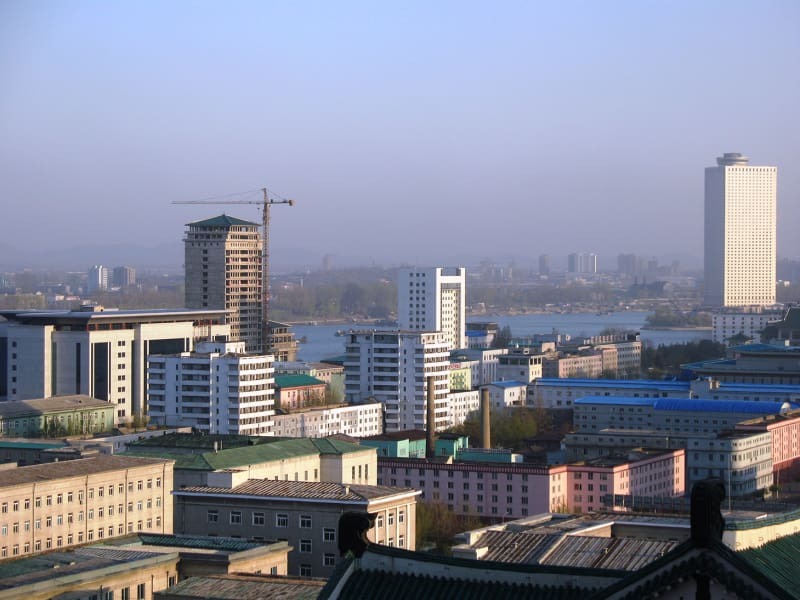 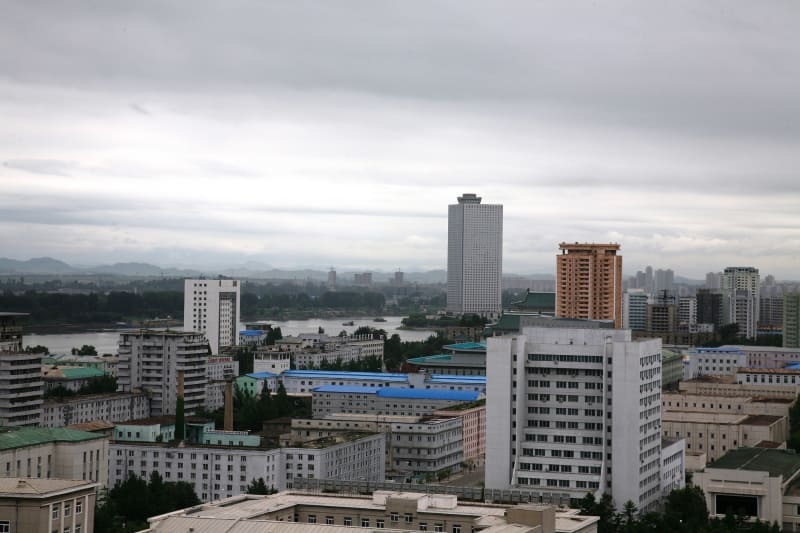 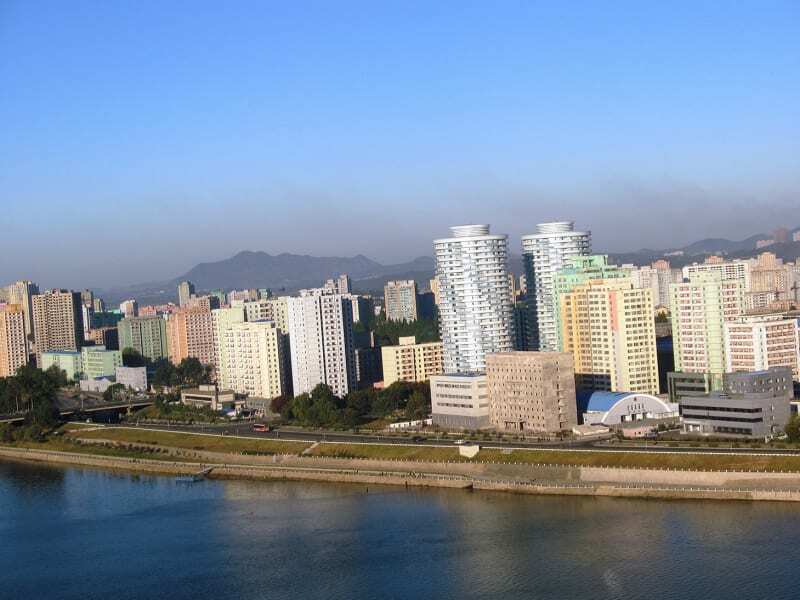 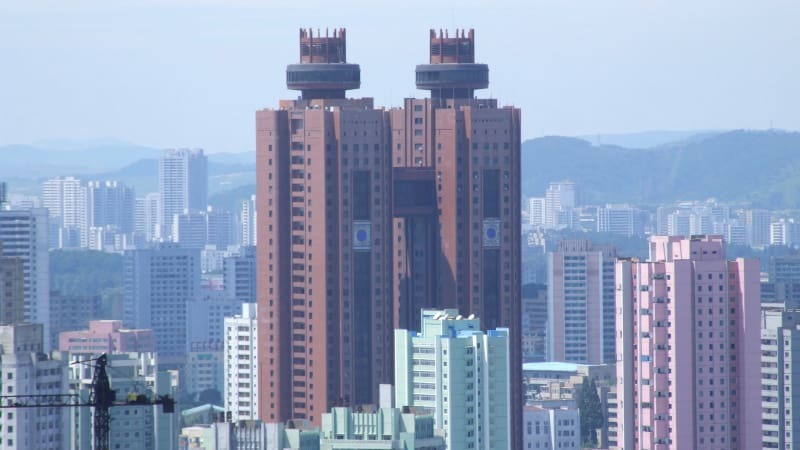 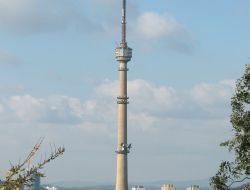 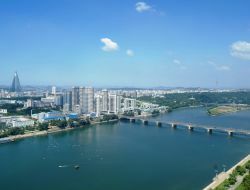 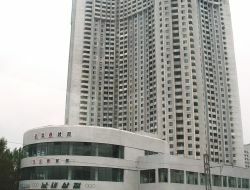 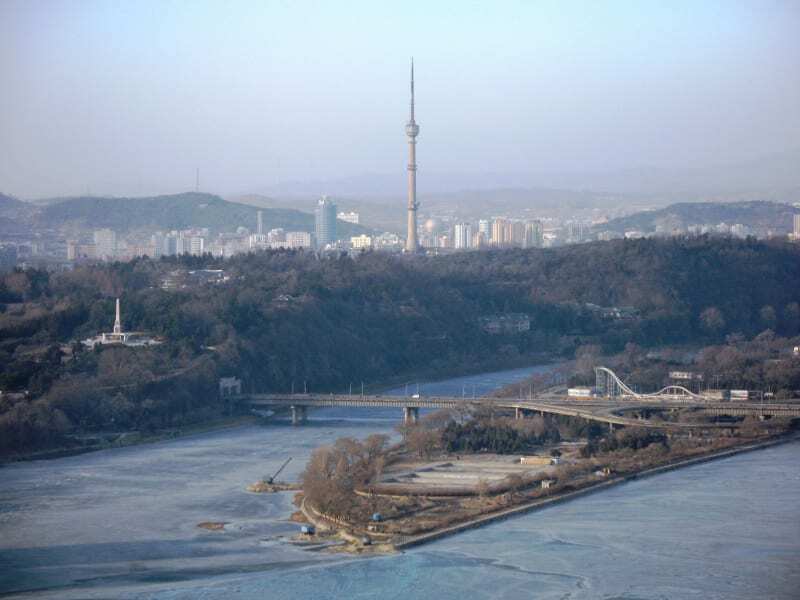 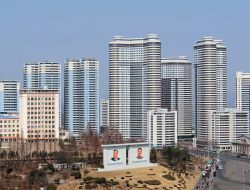 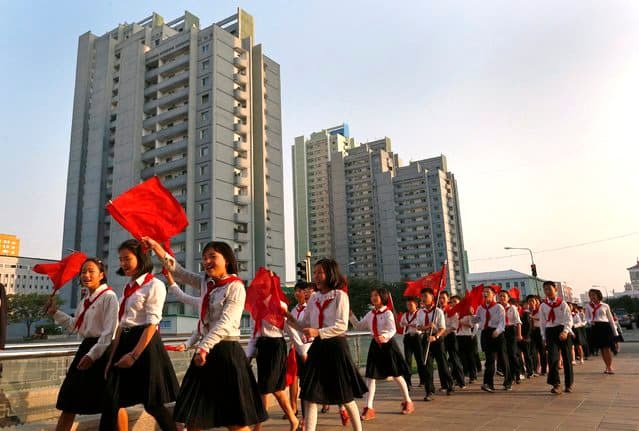 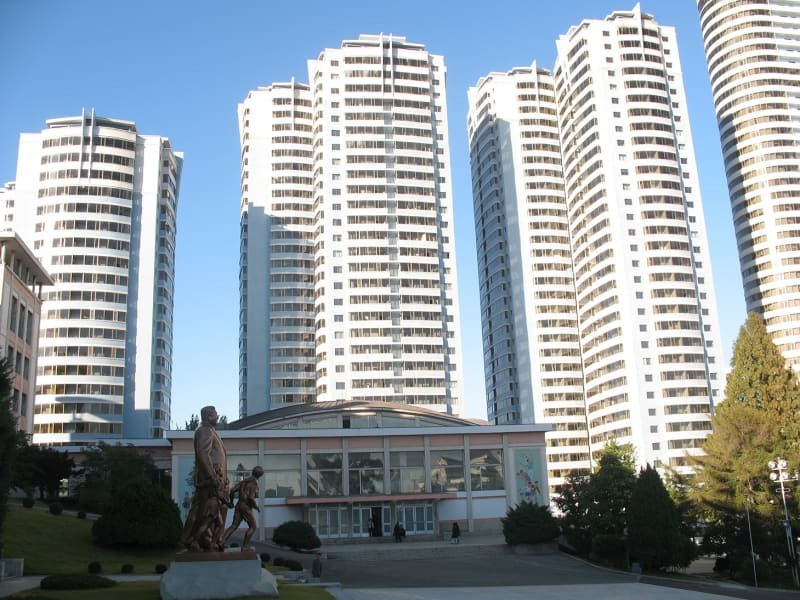 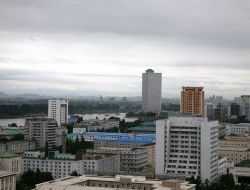 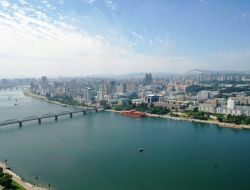 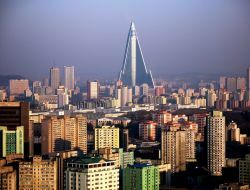 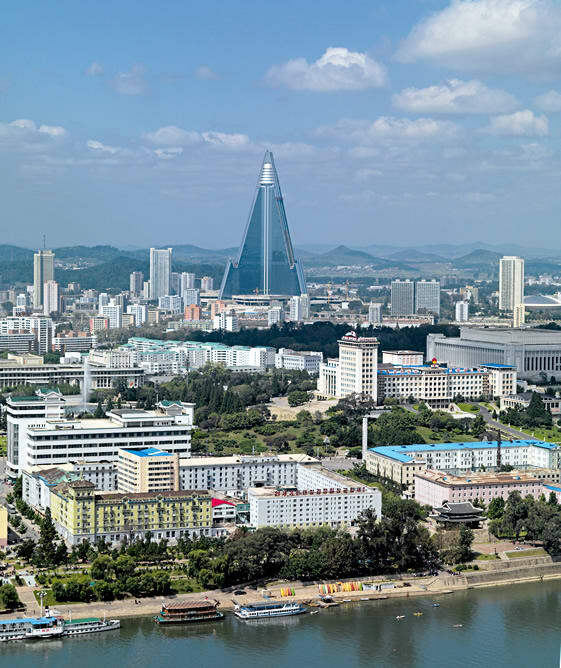 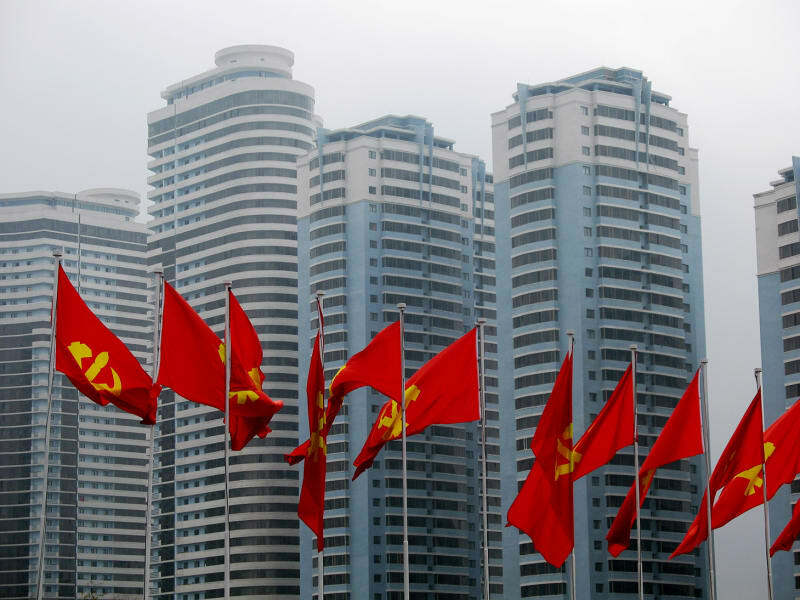 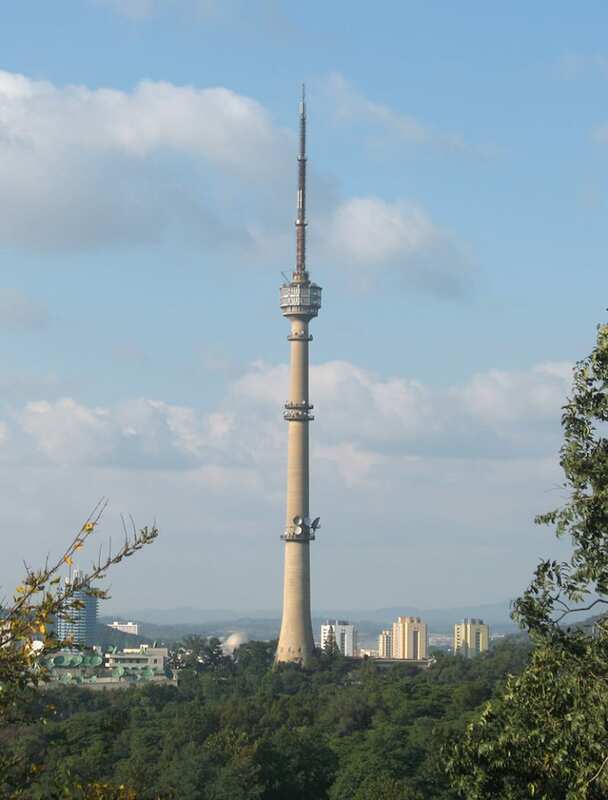 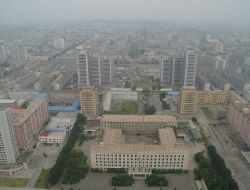 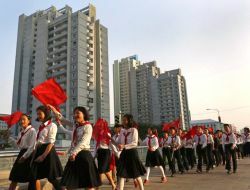 Its name ("capital of willows") is also one of the historical names for Pyongyang.The building is also known as the 105 Building, a reference to its number of floors. 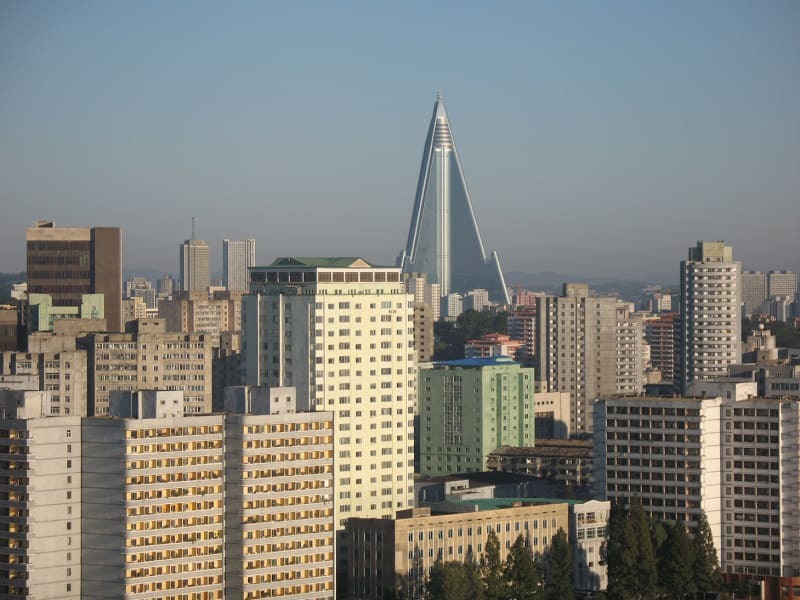 Construction began in 1987 but was halted in 1992 as North Korea entered a period of economic crisis after the fall of the Soviet Union. 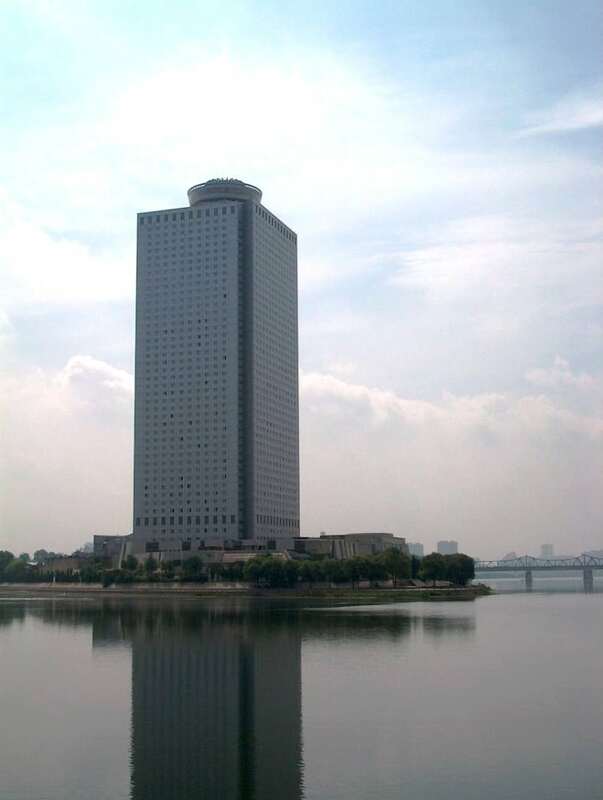 After 1992 the building stood topped out, but without any windows or interior fittings. 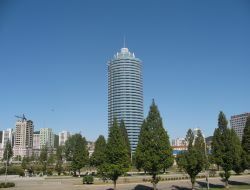 In 2008 construction resumed. 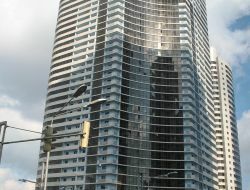 In 2011, the exterior was completed. 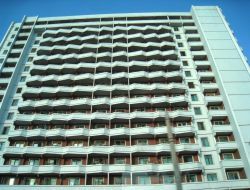 The opening of the hotel has been scheduled several times but postponed. 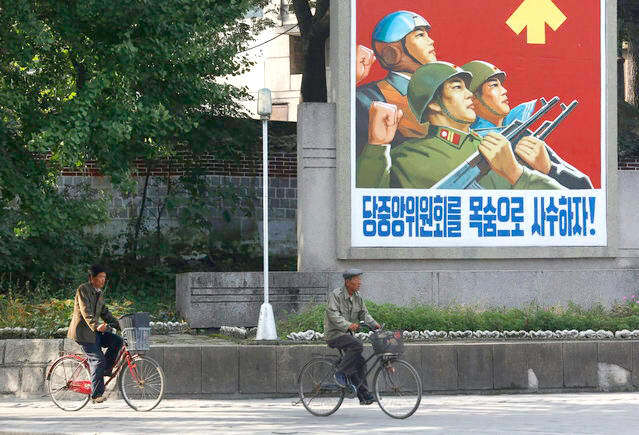 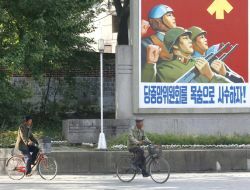 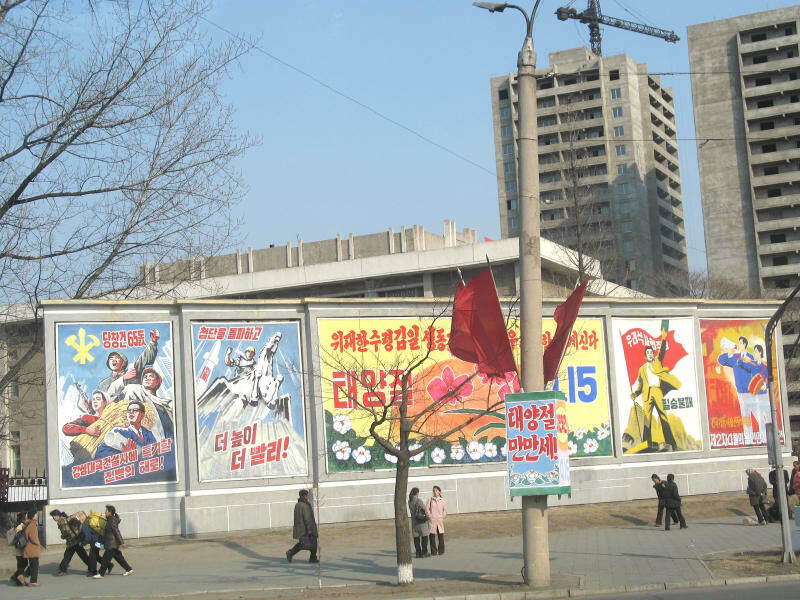 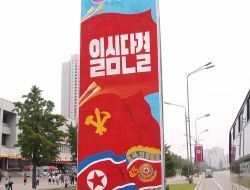 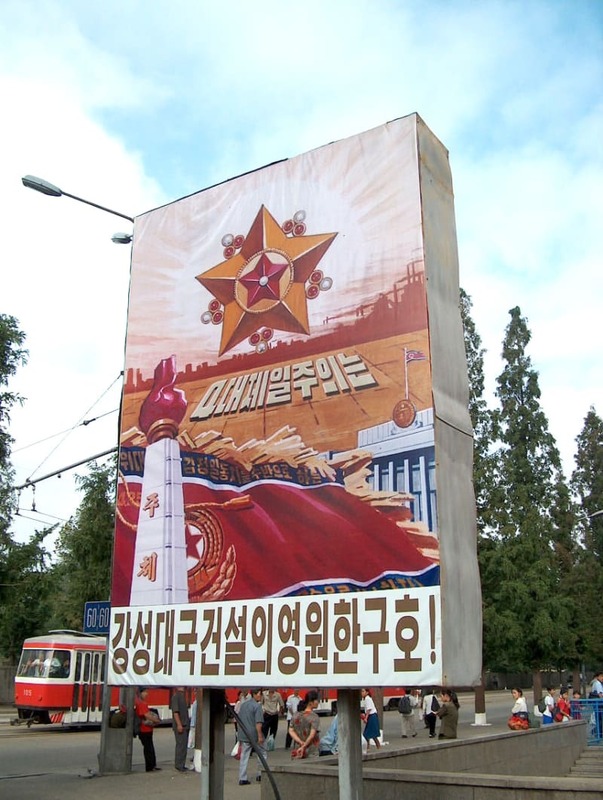 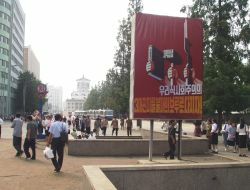 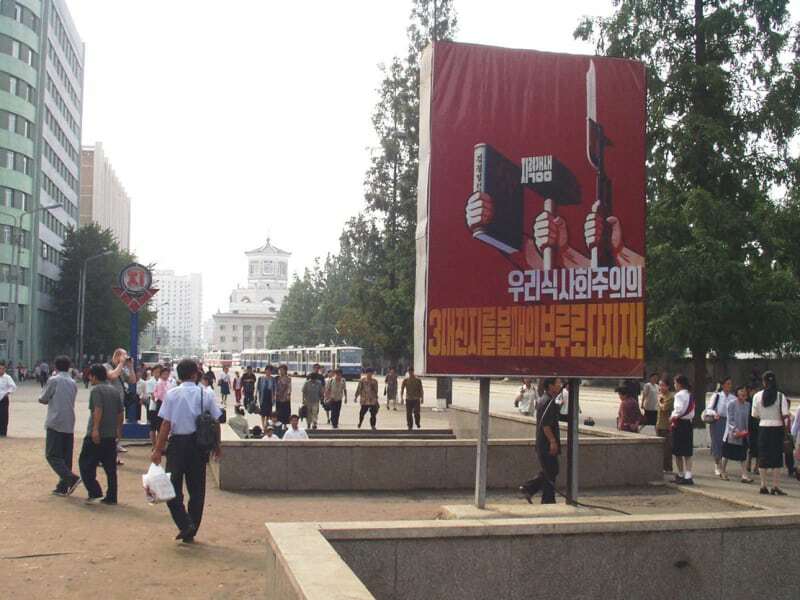 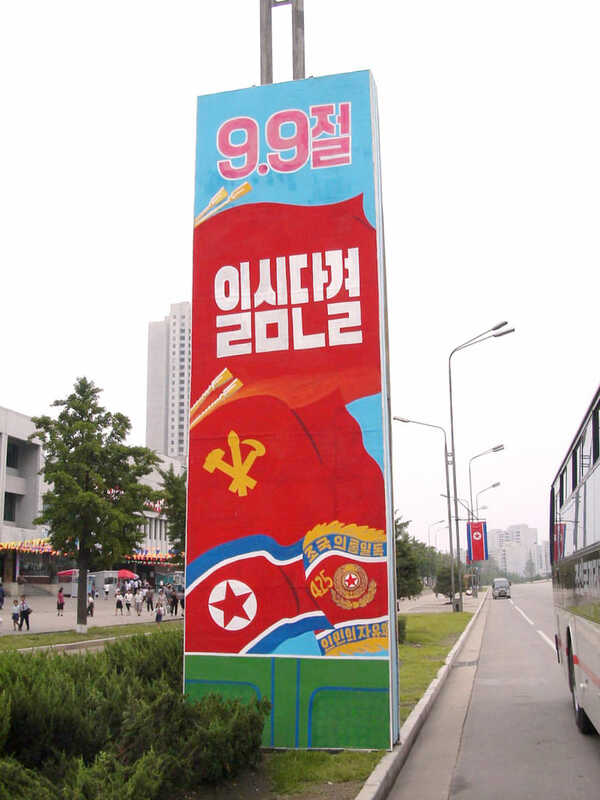 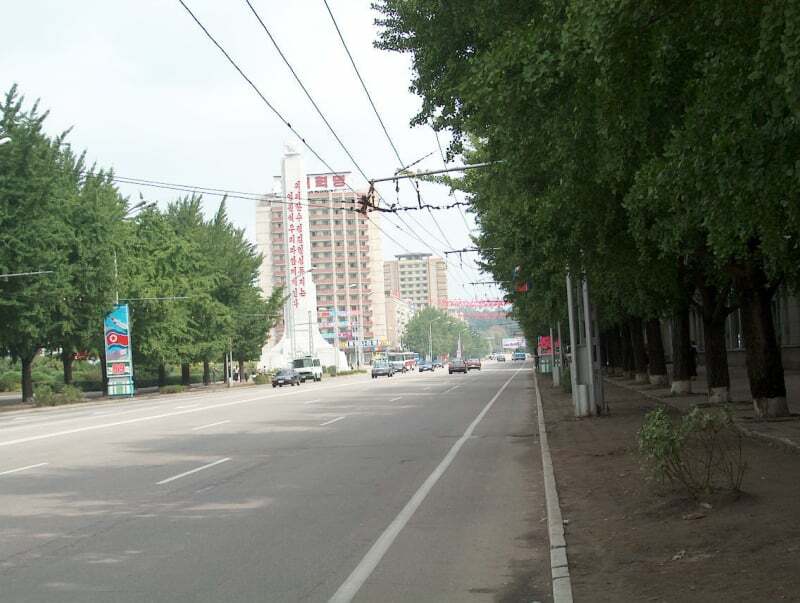 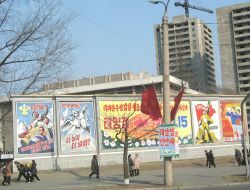 Pyongyang streets are littered with propaganda posters. 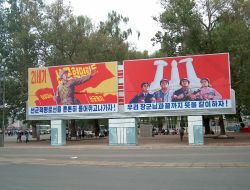 Posters depict the correct actions for every part of life. 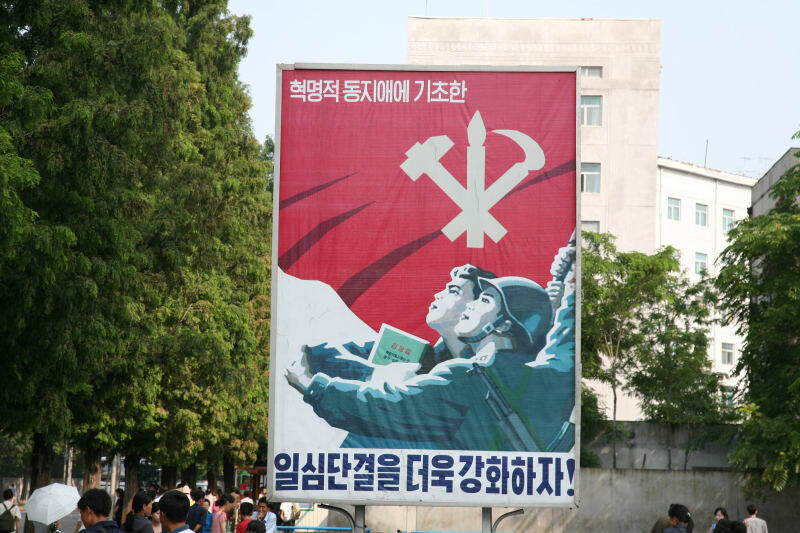 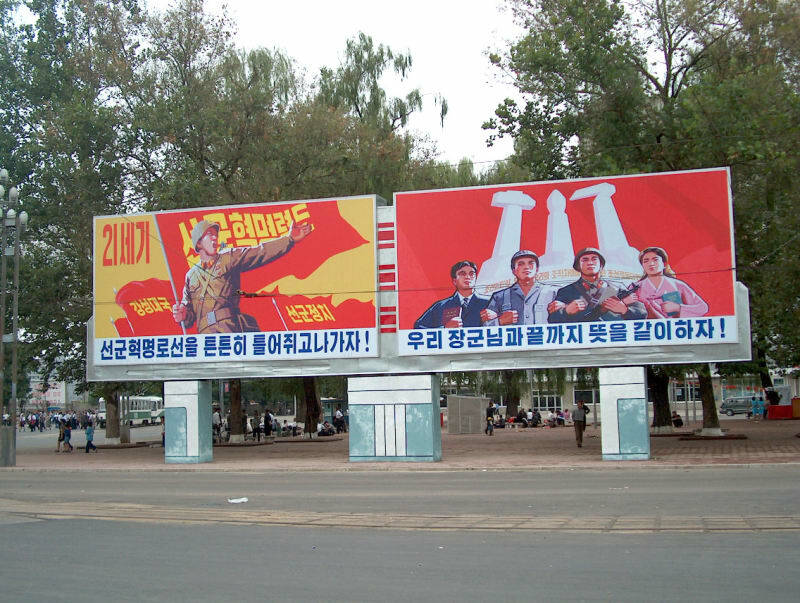 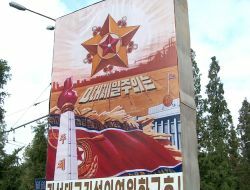 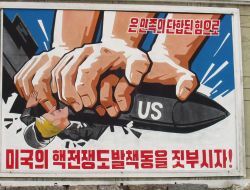 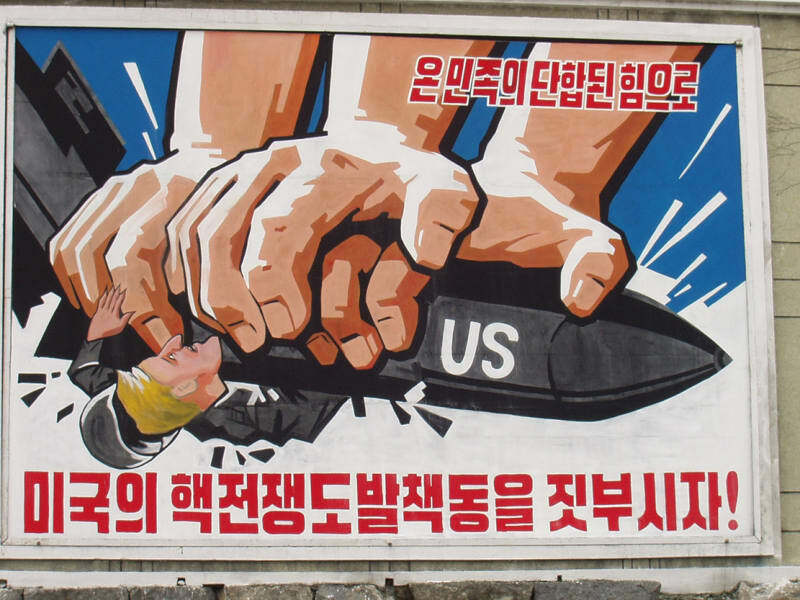 North Korean propaganda posters focus on military might, communist society and devotion to the state, and the leaders' personality.